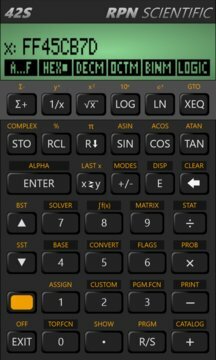 42S is a Windows Phone port of Thomas Okken's excellent Free42, a complete re-implementation of the highly praised HP-42S RPN scientific calculator. Thomas' original code was written from scratch, without using any HP code or using any ROM images, yet it is fully HP-42S compatible. 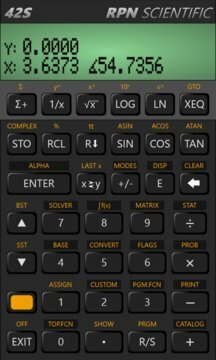 This calculator provides all the functionality of the original HP-42S including several hundred built-in functions, extensive programmability, and printer output emulation. - Extensive programmability for custom functionality. Existing HP-42S code packages can be leveraged for Engineering, Scientific, Financial, Statistical, etc functionality. Backward compatible with HP-41CX programs. - Fixed bug where inserting END from catalog or XEQ "END" into a program caused app to crash. - Increased key hit areas to include entire area surrounding key faces to prevent possible missed key presses. - Allow for large-size tile.